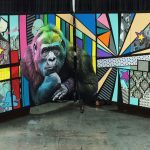 Three day “LIVE” Kreashun Mural at the 2014 International Licensing EXPO at Mandalay Bay Convention Center in Las Vegas, NV. Thanks goes out to the IL EXPO & to Juan Muniz for collabing with us. *View “LIVE” progressive photos through the “Kreashun Murals” link in “Portfolio”.